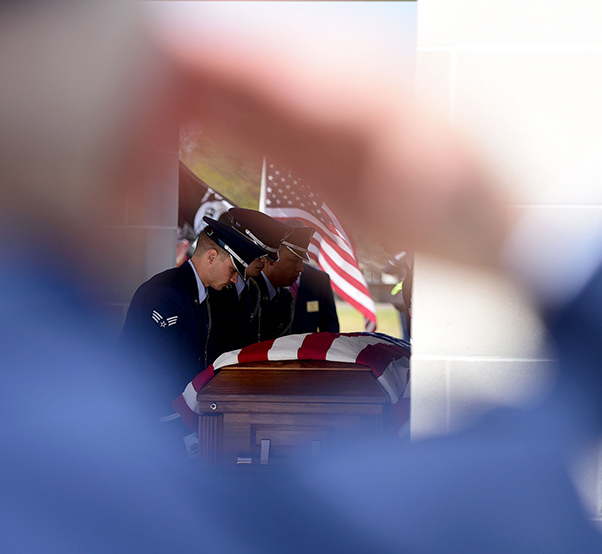 Col. Richard Dickins, 4th Operations Group commander, salutes Col. Edgar Davis as the Seymour Johnson Air Force Base Honor Guard transfers his remains April 6, 2018, Goldsboro, N.C. 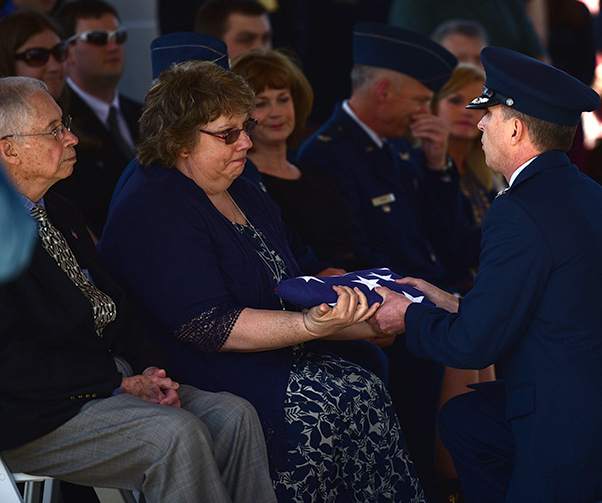 The funeral ceremony was held 50 years after Davis was shot down during a photo-reconnaissance mission over Laos. U.S. Air Force Col. Edgar “Felton” Davis, an RF-4C Phantom navigator during the Vietnam War, was laid to rest after 50 years deceased with full military honors April 6, 2018, in his hometown of Goldsboro, N.C.
Davis was shot down over Laos Sept. 17, 1968 during a reconnaissance mission while assigned to 11th Tactical Reconnaissance Squadron under the 432nd Tactical Reconnaissance Wing and was declared deceased when the first search for his remains yielded no results. 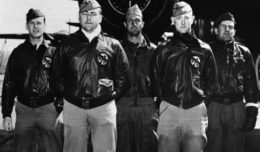 The Defense Prisoner of War/Missing In Action Accounting Agency discovered Davis’ remains in December 2017. 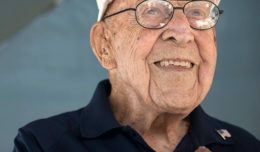 The funeral was held at the Providence United Methodist Church while the burial was held at the Eastern Carolina State Veteran’s Cemetery where his children, siblings and other family members paid their respects and honored their loved one’s life. 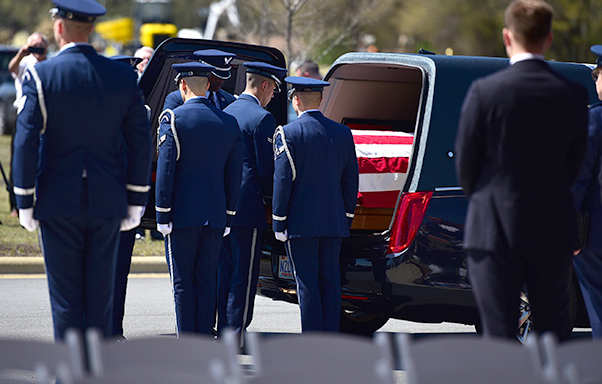 Members of the Seymour Johnson Honor Guard transfer the remains of Col. Edgar Davis April 6, 2018, in Goldsboro, N.C. Davis was shot down during a night photo-reconnaissance mission over Laos during the Vietnam War. After initial rescue efforts were unsuccessful, he was assumed dead and his remains stayed missing for 50 years. Between 2001 and 2015, recovery teams searched for Davis’ remains six times, however, only personal effects were found. A Laotian villager reached out regarding an American service member’s remains in 2015. He said his father had found the pilot and buried him many years ago. The DPAA collected evidence which after analysis matched the Davis family. 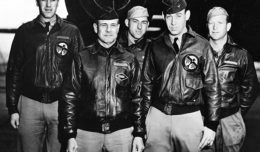 Davis supported a legacy committed to reconnaissance missions while assigned to the 432nd TRW. Today, the 432nd Wing executes similar persistent attack and reconnaissance missions via Remotely Piloted Aircraft. 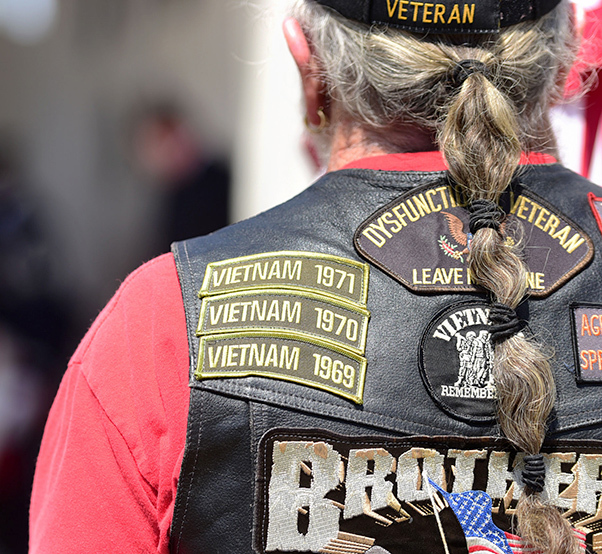 Today, there are more than 1,600 American service members and civilians still unaccounted for from the Vietnam War. 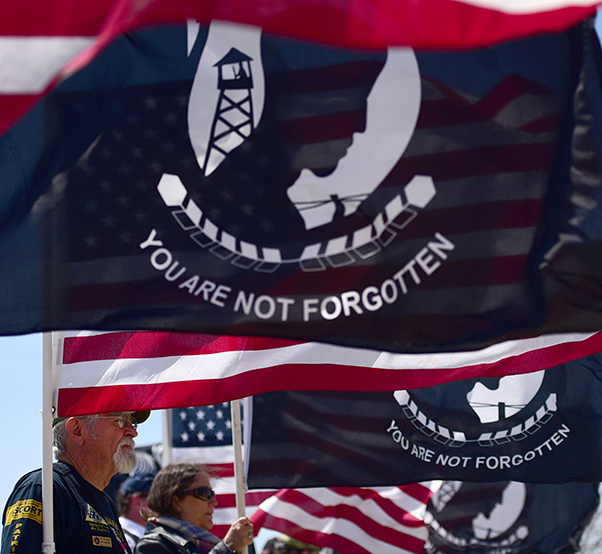 The DPAA continues the search to bring every POW/MIA home. A Vietnam War veteran attends the funeral ceremony for Col. Edgar Davis’ April 6, 2018, Goldsboro, N.C. Davis was shot down Sept. 17, 2018 while navigating an RF-4C Phantom photo-reconnaissance mission. After being shot down over Laos during the Vietnam War in 1968, a Laotian villager buried the remains. In 2015, the villager’s son reached out regarding the location of the remains. The Defense POW/MIA Accounting Agency recovered Davis’ remains in 2017. Seymour Johnson Air Force Base Honor Guardsmen prepare to fold a flag in honor of Col. Edgar Davis during his funeral ceremony April 6, 2018, Goldsboro, N.C. Davis served as an RF-4C Phantom navigator during the Vietnam War assigned to the 11th Tactical Reconnaissance Squadron. The unit exists today as the 11th Attack Squadron flying the MQ-9 Reaper. 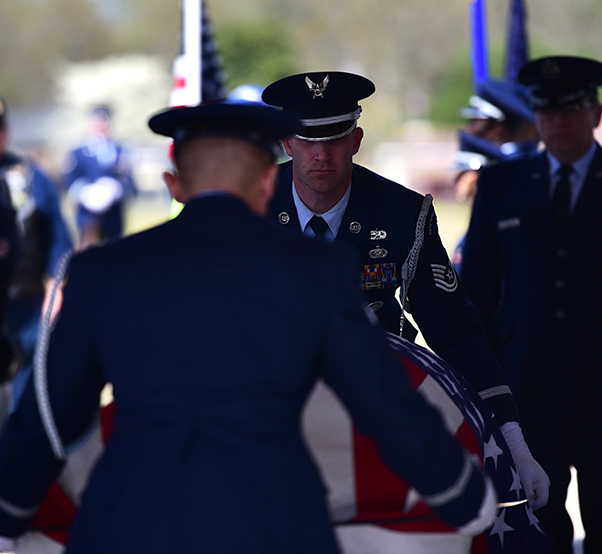 A Seymour Johnson Air Force Base Honor Guardsmen presents a flag in honor of Col. Edgar Davis during his funeral ceremony April 6, 2018, Goldsboro, N.C. Davis was shot down during a night photo-reconnaissance mission over Laos during the Vietnam War. After initial rescue efforts were unsuccessful, he was assumed dead and his remains stayed missing for 50 years. 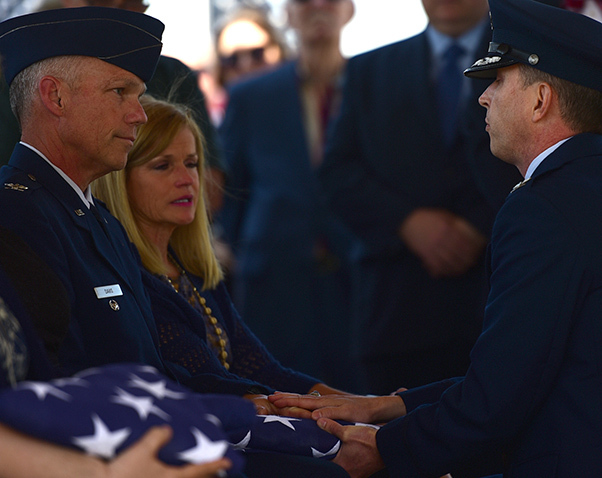 A Seymour Johnson Air Force Base Honor Guardsmen presents a flag in honor of Col. Edgar Davis to his daughter, Martha Morton, during his funeral ceremony April 6, 2018, Goldsboro, N.C. Davis was shot down during a night photo-reconnaissance mission over Laos during the Vietnam War. After initial rescue efforts were unsuccessful, he was assumed dead and his remains stayed missing for 50 years. 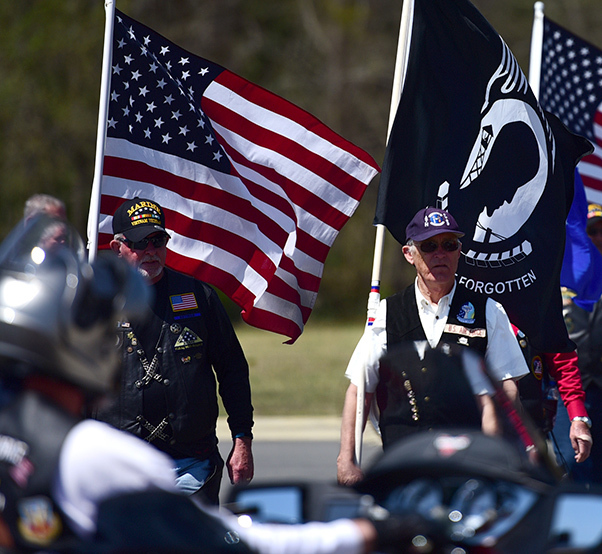 Patriot Guard Riders of North Carolina attend Col. Edgar Davis’ funeral ceremony April 6, 2018, in Goldsboro, N.C. Davis was shot down during a night photo-reconnaissance mission over Laos during the Vietnam War. After initial rescue efforts were unsuccessful, he was assumed dead and his remains stayed missing for 50 years. Patriot Guard Riders of North Carolina attend the funeral ceremony for Col. Edgar Davis April 6, 2018, in Goldsboro, N.C. Davis served as an RF-4C Phantom navigator during the Vietnam War assigned to the 11th Tactical Reconnaissance Squadron. The unit exists today as the 11th Attack Squadron, flying the MQ-9 Reaper. 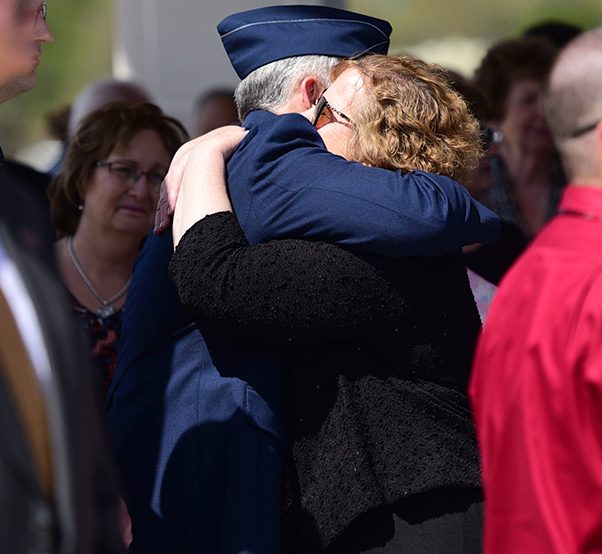 Members of Col. Edgar Davis embrace each other after his funeral ceremony April 6, 2018, Goldsboro, N.C. Davis was shot down during a night photo-reconnaissance mission over Laos during the Vietnam War. After initial rescue efforts were unsuccessful, he was assumed dead and his remains stayed missing for 50 years. 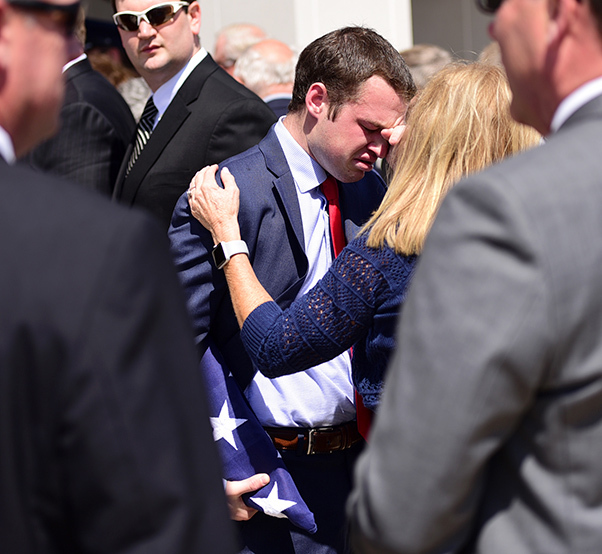 Matt Davis, grandson of Col. Edgar Davis embraces a family member after his grandfather’s funeral ceremony April 6, 2018, Goldsboro, N.C. After being shot down over Laos during the Vietnam War in 1968, a Laotian villager buried the remains. In 2015, the villager’s son reached out regarding the location of the remains. The Defense POW/MIA Accounting Agency recovered Davis’ remains in 2017. 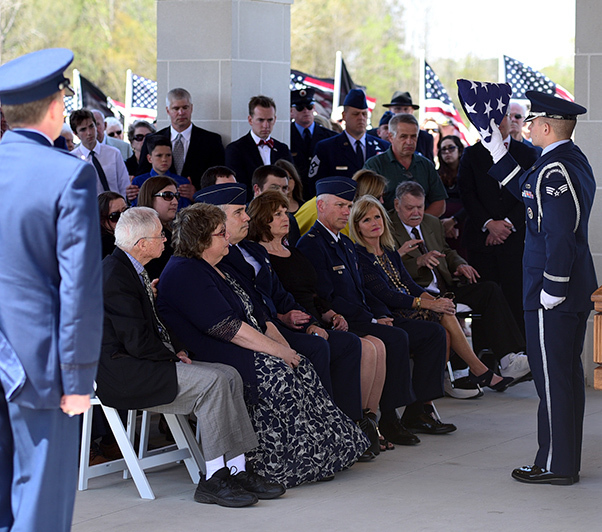 A Seymour Johnson Air Force Base Honor Guardsman presents a flag in honor of Col. Edgar Davis to his son Col. Alan Davis during his funeral ceremony April 6, 2018, Goldsboro, N.C. After being shot down over Laos during the Vietnam War in 1968, a Laotian villager buried the remains. In 2015, the villager’s son reached out regarding the location of the remains. The Defense POW/MIA Accounting Agency recovered Davis’ remains in 2017.